The easternmost Canadian province—Newfoundland and Labrador—consists of Newfoundland Island (with an interior of myriad glacial lakes and forests) plus the Labrador territory on the mainland (with more lakes and land that is nearly half moss barrens and bogs). Newfoundland(as its name is often shortened) has a jagged coast marked by bays, cliffs, coves, islands, and fiords and is lined with fishing villages. I visited the province in 2008 initially to investigate the Lake Crescent creature for an episode of Monster Quest (which aired on the History Channel September 17 of that year). Our crew was hosted by the villagers of Robert’s Arm who generously treated us to a huge seafood dinner and much “screech” (rum), while making each of us—in a rather drunken ceremony—an “Honorary Newfoundlander” (Nickell 2009). I had flown into the airport at Deer Lake and driven to Robert’s Arm on a lucky Friday the thirteenth of June. After that night’s festivities and the next long day of filming, I set out on the Viking Trail for the World Heritage Site of L’Anse aux Meadows and, for the next few days, other sites including Labrador, finally flying out of Deer Lake on the eighteenth. Here are some investigative highlights. Figure 1. 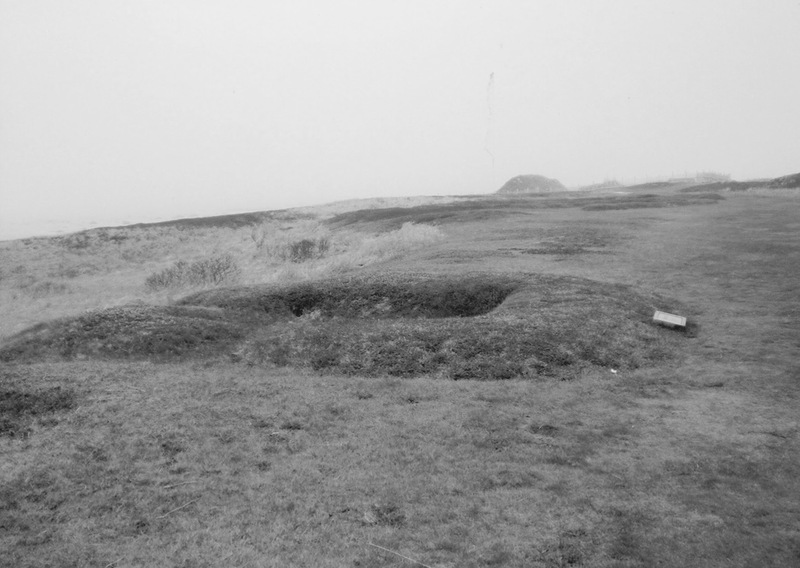 Remains of Viking sod structures such as this are scattered about L’Ance aux Meadows at the tip of Newfoundland’s Northern Peninsula. Various questionable Viking sites and artifacts are known—for instance a “Viking church” in Newport, Rhode Island (which is actually a stone windmill from the colonial period), and the Kensington Rune Stone (a forgery from the nineteenth century). However, there are genuine Viking artifacts—such as a Norse coin from the eleventh century, discovered on the Maine coast—although these may be either from Viking visits or simply the result of trade (Bahn 1995, 234–235; Feder 1996, 111–115). It is indisputable, however, that there was a Norse settlement in early North America. It is located at the northernmost point of the island of Newfoundland. I made my way there on June 15, 2008 (having a picnic lunch of moose burger, as I wrote in my journal, “at a scenic beach site”). Arriving at L’Anse aux Meadows, a UNESCO World Heritage Site, I learned that it was believed settled by a Norse expedition led by Leif Ericson. The Vikings followed Greenland’s coast, crossed to Baffin Island and Labrador, then, traveling south, entered the Strait of Belle Isle where they saw land on either side of their ship. They crossed to the eastern side and there—at the tip of the Great Northern Peninsula—built a settlement of sod houses. This would serve as base camp for additional explorations southward (Bock 2008, 39). The site was discovered in the early 1960s by a Norwegian team led by Helge and Anne Stine Ingstad. They had looked for Viking landing places along the eastern North American coast, searching northward from New England. Reaching the northern tip of Newfoundland Island, they were directed to a group of unusual mounds by a man named George Decker, one of the local residents who had long known there were ruins of an ancient settlement. Anne Stine Ingstad, an archaeologist, directed the excavation of the site from 1961–1968 (Bock 2008, 39; Colombo 1988, 1–2; Feder 1996, 116–118) (Figure 1). In addition to eight turf houses, they discovered four boatsheds, an iron smithy, and a variety of artifacts. Radiocarbon dating provided a mean age of 920 ce (Feder 1996, 116–118). 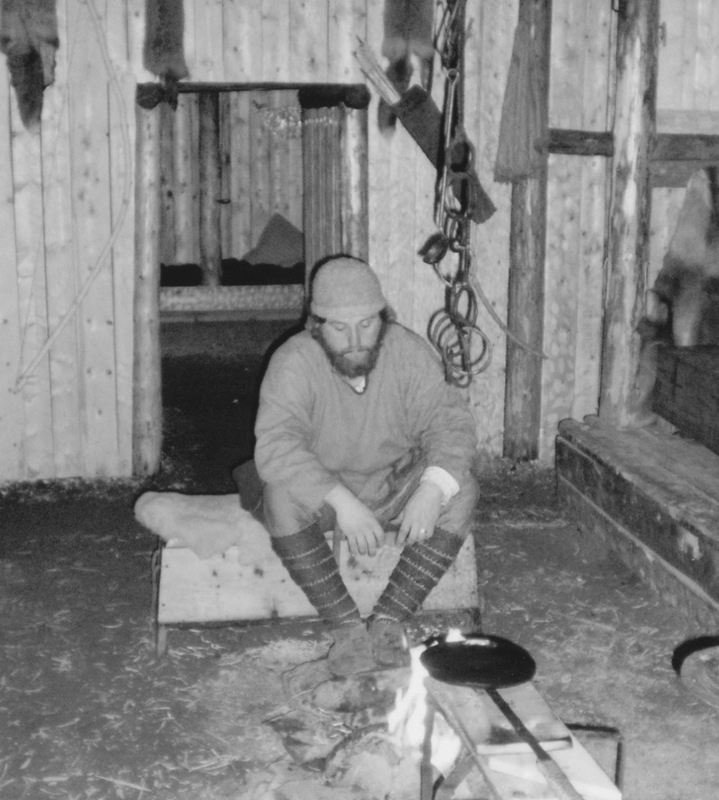 I studied the entire site, including museum displays, and sat at a fire in a sod hut with a costumed interpreter as part of the “Viking experience” (Bock 2008, 38) (Figure 2). Helge Ingstad identified L’Anse aux Meadows as the long-sought Vinland—the Vineland or Wineland of the old Norse sagas—and others have accepted this as so. However, the Newfoundland climate of a thousand years ago, although warmer than now, would not have supported the growth of wild grapes. “Nevertheless,” as archaeologist (and CSI fellow and friend) Kenneth L. Feder concludes, “wherever Vinland actually was, the sagas seem to indicate quite clearly that the Vikings indeed discovered, explored and attempted to settle the New World about five hundred years before the Columbus voyages” (1996, 113). In his book of “unexplained” mysteries of Newfoundland and Labrador, Dale Jarvis (2005, 104–108) discusses a strange creature in his entry on L’Anse aux Meadows. He cites the medieval Icelandic narrative The Saga of Eirik the Red. This relates the death of Thorvald Eiriksson (i.e., Eirik’s son), who was killed by one of a supposed race of unipeds—or one-legged humanoids. The Norse words used to refer to the One-footer or uniped—einfæting, einfætingi, einfætigur, einfætingaland, etc.—are from the root meaning “one-foot” or “one footed.” In one narrative, Grettis Saga, it describes a man with a wooden leg (Einfætingur 2015). Other than the assertion in Eirik the Red’s Saga, there is no reason to think the entity that killed Thorvald was from a race of One-footers—of which there is neither fossil record nor historical proof in any case. Rather, it appears the arrow-shooter was merely a single individual of those the Vikings called the skrælings: Native Americans who were the possible ancestors of the Beothuk and the Mi’Kmaq. The saga writer, a medieval scholar, may simply have added a stock motif of the genre of “medieval traveler’s wonder tales” (Einfætingur 2015). The assailant might even have been a one-legged Indian! As we shall see, another Newfoundland entity is much more familiar to us—though not without a twist. It inhabits a “spooky story” told “several years ago” in the area of Deer Lake (Jarvis 2005, 137–138). I arrived there on returning from the Northern Peninsula (after a side trip to Labrador). A prime example of the adaptability of older legends is “The Vanishing Hitchhiker”—the classic automobile legend. This returning-ghost tale was known by the turn of the [twentieth] century both in the United States and abroad. It acquired the newer automobile motif by the period of the Great Depression, and thereafter spawned a number of subtypes with greatly varied and oddly interlocking details, some of which themselves stemmed from earlier folk legends. The many variants, observes Brunvand, point to “the legend’s incredible development.” Nevertheless, just to give the lady in white a chance to appear, on the evening of June 17, 2008, I drove from Deer Lake to Corner Brook—an uneventful trip. The desolation of Labrador is said to be the haunt of the Phantom Trapper or the Damned Trapper. Following several accounts there was once a trapper who led a wicked life. Despite his vile acts, which included peddling poisoned alcohol and attacking local women, he never repented his crimes and sins and died a natural death. But in death he found no rest, for to atone for his sins he was cursed to drive through the snow throughout eternity a matched team of fourteen pure white huskies. The vision of the Phantom Trapper making his ghostly rounds is said to be a harrowing one. Yet Newfoundlanders rejoice in the sight of him and his team, for he helps to guide lost travellers and trappers through blizzards to safety. This cursed, Cain-like creature was last spotted on his life-saving rounds in 1959. The trapper’s name was Esau Gillingham. The true facts of his life are mixed with legend, in which he is sometimes called “Smoker” (after a vile alcoholic concoction he allegedly brewed—from spruce cones, yeast, and sugar—known as “smoke” [Jarvis 2005]). Gillingham left a will, which was probated in 1920, giving some facts about his family and property (Gillingham 1920). He was later fictionalized in White Eskimo: A Novel of Labrador, in which he was described as a “giant stranger” who “came down out of the hills in the dead of winter dressed in the skin of a white bear, driving a team of white dogs . . .” (Horwood 1972, 8; see also, Rosengarten 1973). Not surprisingly, there are variants of the tales told about the trapper. For example, regarding the motif (story element) of his all-white team of huskies, one source says there were eight dogs (Schlosser 2010), while another confidently states fourteen (Jarvis 2005, 143; 2014). In my experience, such precise details are less likely to be reported by someone having an apparitional experience (Nickell 2012, 345) than they are by raconteurs interested in dressing up a story. Again, in the variant tales, the trapper’s fate was that he either became lost in a snowstorm and died (Jarvis 2014), or became drunk and suffered a fall from which he lingered for three days (Jarvis 2005, 143), or “went a little too far in his pursuit of a local innkeeper’s fair wife and was shot to death by her disgruntled husband” (Schlosser 2010). Then again, maybe he simply “died a natural death” (Colombo 1988, 11). You decide. Consider the cleverness of the following story. A man with a dog team was lost in a blizzard when another man and team—all in white—came by and could be followed to the safety of some fishermen’s winter huts. When the man who had been lost remarked to a fisherman about the team that had passed before him, he received the reply that there had been no one ahead of him (Jarvis 2005, 143). This is the punch line that makes clear—with spine-tingling effect—that the tale is one of ghostlore. But are the profound differences due to folklore (the oral tradition at work) or fakelore (writers deliberately making things up)? Could some of the tales even relate actual encounters with the phantom trapper? Well, the tales frequently employ passive-voice constructions (“it was rumored that” [Schlosser 2010]), as well as other devices to obscure sources (“Other folks say,” “Legend maintains that,” “Still others claim” [Jarvis 2005; 2014]). This approach—in which alleged eyewitnesses’ names, dates, and precise source citations are missing—demonstrates that such narratives are written for their entertainment value. We should therefore give them no more seriousness than they deserve. Thanks to CFI Libraries Director Tim Binga and Melissa Braun for their research assistance. Bahn, Paul G. 1995. 100 Great Archaeological Discoveries. New York: Barnes & Noble Books. Bock, Allan, ed. 2008. Where It’s At: Official 2008 Tourist Guide of the Viking Trail and Labrador Coastal Drive. St. Anthony, Newfoundland, Canada: Transcontinental Media. Brunvand, Jan Harold. 1981. The Vanishing Hitchhiker. New York: W.W. Norton and Co.
Colombo, John Robert. 1988. Mysterious Canada: Strange Sights, Extraordinary Events, and Peculiar Places. Toronto: Doubleday Canada. Einfætingur: The One-Legged Beast from Eiriks Saga & the Medieval Traveler’s “wonder stories.” 2015. Online at http:/www.vikinganswerlady.com/Einfaettr.shtml; accessed July 21, 2015. Feder, Kenneth. 1996. Frauds, Myths, and Mysteries: Science and Pseudoscience in Archaeology, 2nd ed. Mountain View, CA: Mayfield Publishing Co.
Gillingham, Esau. 1920. Probated will signed August 7, 1914; Newfoundland will books, vol. 11, p. 517. Online at http://ngb.chebucto.org/Wills/gillingham-esau-11-517.shtml; accessed July 24, 2015. Horwood, Harold. 1972. White Eskimo: A Novel of Labrador. Don Mills, Ontario: PaperJacks. Jarvis, Dale. 2005. Wonderful Strange: Ghosts, Fairies, and Fabulous Beasties. St. John’s, Newfoundland: Flanker Press, 142–144. ———. 2014. Smoker the ghostly trapper of Labra­dor. Online at http://www.thetelegram.com/OpinionColumnists/2014-12-15/article-3976088/Smoker-the-ghostly-trapper-of-Labrador/1; accessed July 23, 2015. Nickell, Joe. 2009. Quest for the giant eel. Skeptical Inquirer 33(4) (July/August): 18–20. ———. 2012. The Science of Ghosts: Searching for Spirits of the Dead. Amherst, NY: Prometheus Books. Quinn, Edward. 1999. A Dictionary of Literary and Thematic Terms. New York: Checkmark Books. Rosengarten, Herbert. 1973. Survival of the fittest. Canadian Literature 58 (Autumn): 92–95; online at http://canlit.ca/reviews/survival_of_the_fittest; accessed July 23, 2015.
folklore/2010/07/the_trappers_ghost.html; accessed July 23, 2015. Sephton, Rev. J. 1880. Eirik the Red’s Saga: A Translation. Read before the Literary and Philosophical Society of Liverpool, January 12. A Project Guten­berg eBook, online at http://www.gutenberg.org; accessed July 17, 2015.